By the time USA was released, seven months had elapsed since King Crimson’s dramatic abdication. The trio that recorded Red had gone their separate ways. Bill Bruford had initially found work with Gong before going on to sessions with a diverse array of players including his ex-Yes colleagues Chris Squire and Steve Howe as they worked on their solo albums, as well as stints with National Health and eventually finding a home in the company of Roy Harper’s Trigger. Fripp meanwhile was busy getting his affairs in order as he prepared to enter JG Bennett’s International Academy for Continuous Education in Sherborne, Gloucestershire. Part of that process included tending to King Crimson’s recorded legacy and curating a live album that would act as the 1974 quartet’s swansong. Fripp and Wetton had discussed the idea of a live album for the band during Crimson’s final American tour but only now, after the band had famously ceased to exist, did the pair finally get around to working on it. Wetton who at the time was on tour with Roxy Music recalls David Enthoven (Roxy Music and Crimson’s manager) asking him to get involved. “He said we'd have to do something about a live album from the last tour. So I said I don't have a problem with that, just tell what time the studio is booked and I'll turn up." Less than a week of studio time was booked at Olympic Studios where they had played together on Red in July the previous year. Working between 2pm and 8pm each day, the musicians settled on the gig at the Casino, Asbury Park, on June 28, 1974, for the bulk of the album with the gig at Providence two days later providing 21st Century Schizoid Man. Listening to the tapes, it was felt that some of David Cross’s violin and electric piano parts were in need of being beefed up. With Cross off holiday around Ireland at the time, Wetton’s colleague in Roxy Music, Eddie Jobson was drafted in to undertake the repair work. Wetton recalls that Fripp and the violinist got off to a slightly awkward start. "Robert made the mistake of saying something like 'So, young Edward, you've come to give us a hand' to which a none-too-pleased Eddie replied 'My name isn't Edward — it’s Edwin'." 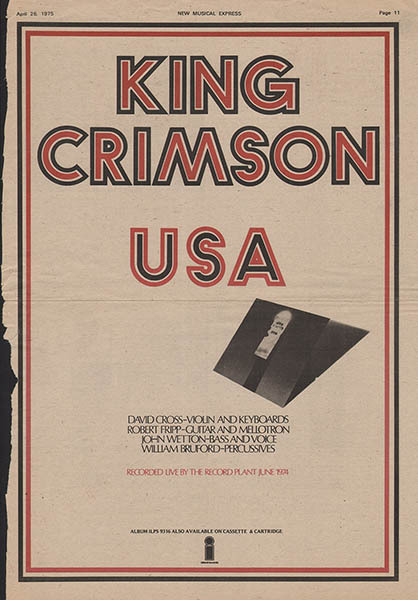 After three or four days’ mixing and fixing, USA, the second live King Crimson album, was released in April 1975. The cover, based on an idea by John Wetton and strikingly photographed by Willie Christie (who had previously worked on the cover to Fripp and Eno’s No Pussyfooting), featured an eerie visual echo of the Statue of Liberty. The photo of an outstretched hand used on the back cover came about while on tour in the States. “We’d received an invitation to go to Lamar University in Texas when we were playing there. They did this thing called Kirlian Photography and we went and had our auras photographed. I remember Robert trying to top his up in the sunshine, standing outside to make sure he had the best aura photograph. Of course they were all the bloody same!” laughs David Cross. The band submitted their hands and faces to the experimental photographic technique developed in the Soviet Union by Seymon and Valentina Kirlian in 1949, which purportedly reveals the aura or field of energy surrounding all living material. The glowing hand seems emblematic of the unseen energies and musical ESP which the band frequently channeled in concert. Initially some consideration was given to using all of the Kirlian portraits but in the end only Wetton's hand was used. Released in April 1975, without the momentum of a live touring band, the album barely caused a flicker in the country after which it was named and didn’t even chart on KC’s home turf. Critics were generally unimpressed save for the electrifying Asbury Park, an improvisation of such power it remains a favourite of Fripp, Wetton and Bruford to this day, as well as legions of fans. Undoubtedly the high point of the album its energy belies the fact that they were playing on a cold, rain-sodden evening to a half-empty house. When reissued in 2002 as part of King Crimson’s 30th Anniversary editions, although tracks from the rest of the Casino gig had been added Fripp decided against undoing the edit at the end of Asbury Park and Easy Money which fades out on a sublimely meditative guitar solo. Though its release was welcomed by fans it was a frustrating experience for those wondering what happened next on those respective tracks. For that they would have to wait until 2005 when the unedited concert was the very first to be made available on Fripp’s DGM Live website.